Danny O’Brien flies in from Italy on Saturday confident he can treat himself to a homecoming treble. The trainer saddles up three leading chances — De Little Engine, Decircles and Miss Rose De Lago ­— and says the trio have been specifically set for Flemington finals day. The day will not be without its challenges, O’Brien lands at Melbourne Airport at 6am and will barely have time to unpack his holiday suitcases before he heads to the track. “You are always better to push through and try to get back on the right leg,” he said before boarding a plane in Rome. Bleary-eyed or not, O’Brien is expecting a big run from Miss Rose de Lago, a $3.70 favourite in the 1400m Leilani final. James Winks takes the ride. The Flemington trainer says his four-year-old mare, sent to the stable by clients from Perth, is in great shape following a brave on-pace second last start on “a ridiculously hot speed”. “She got chasing on a speed that was suicidal and she really hung on very well, considering the way that race panned out. She couldn’t be better for the final,” O’Brien said. O’Brien said he was aiming for a summertime repeat for Decircles ($7), a last-start second to Amovatio, in the 1200m Sprint Series Final. Decircles dropped back from 1400m on New Year’s Day to win the 1200m Standish Handicap, pictured here, wearing down speedy frontrunner Lord Of The Sky. “It is a formula that has worked for us in the past. He certainly came back to his better form the other day, and his form at Flemington down the straight is terrific,” O’Brien said. 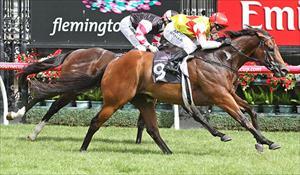 O’Brien will look to close out his treble with De Little Engine ($3.70) in the last race, the 2600m Banjo Paterson. He said the four-year-old gelding had been the victim of wide draws and race patterns at his past two starts. With in-form Damien Oliver riding on Saturday, he is hoping the jockey can use the extra 100m into the first turn to take up a more forward position from barrier 11. “Both of his last two runs have been exactly the same — he got a long way back in races where they spread right out and he just had an impossible task,” O’Brien said. Both Cadillac Mountain ($5.50) and Cooldini ($4.80) have drawn inside gates in the Banjo Patersen, but O’Brien expects De Little Engine will be hard to beat if the galloper can lay up a little bit closer to the speed and doesn’t concede too much ground turning into the straight. Moving beyond the winter finals, O’Brien expects Bondeiger to trial at Flemington shortly and has big expectations for the Victoria Derby runner-up moving towards the spring.